Sharks manifesting in pools, bathtubs, and other places where sharks should not be. The anomaly's a fairly large area within a town where any body of water larger than a certain amount is able to connect to another dimension that's essentially a giant ocean filled with sharks. 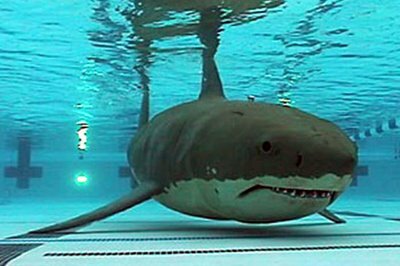 The substance holding the body of water doesn't change for humans, but the sharks are able to treat it as water – for example, you're in the public swimming pool and a shark swims through one wall of the deep end, eats you, and swims out the other side. Obviously, these sharks are fine in any type of water, be it desalinated, chlorinated, etc. Will this stand on its own, or is it lacking some *ahem* bite? - Gotta punch 'em all! In my personal headcanon, this is also the anomaly that's managed to affect every body of water everywhere in the SPC-verse, and the poor souls are just trying to deal with it the only way they know how. Somehow, though, I doubt this will make its way into the article. for example, you're in the public swimming pool and a shark swims through one wall of the deep end, eats you, and swims out the other side. I'm incredibly picky with shark articles. I like sharks. There's an aquarium that I visit sometimes, and I spend hours at the shark exhibits drawing pictures. They're quite nice. As such, I'm not too big on the "OH MAN THEY'RE IN THE POOL THEY'RE GONNA EAT YOU" approach, especially given that there's only a couple of sharks in the world that would do a human serious harm, and (from what I remember, anyway) even fewer sharks that would actually not spit out a human after a let's-see-what-this-is chomp. I feel like this might be an interesting article if you play up the weird angle more than the horror. Also, remember to do your research on the sharks. Also, bamboo sharks are essentially sleepy sea puppies and I would not object at all to finding one in my local public pool. Confused and a little concerned, maybe, but definitely not scared. I have to admit that this skip idea came directly from watching Jaws, so you're right – I need to avoid going down the old "sharks are bad and they're gonna KILL you!" road. What if, instead of just sharks, the anomaly connected to an ocean full of… a bunch of things? There would be sharks, and dangerous creatures, but more often than not a swarm of strange-looking tropical fish would swim through your bathtub rather than something dangerous. Of course, there are dangerous things too, but that way I think it's more representative of real-life ecosystems. The anomaly is connected to an Eldritch being's fishtank. There's all sorts of creepy sea creatures with extra eyes and tentacles and mouth-parts, and the Eldritch being was trying to open up portals into the netherworld(s) to improve their fishtank experience, but ended up leaking their precious tank fish into the human world instead. How can we tell it's a fishtank? some of the "fish" still have their price tags or some Eldritch equivalent on them. I may simplify the 'fishtank experience' angle a bit, but I do think it would be a pretty hilarious end to the article for some kind of D-Class exploration to come across the eldritch equivalent of a giant glass wall. I might hold off on this one until after the D-Class contest, but thanks so much for the feedback! This should be fun to write.